A proper installation: In the photo above, the dark walnut release color shows only in the joints and depressions. The high spots show only the lighter base color. A worker applies Dark Gray antiquing release to stenciled concrete prior to texturing it with a roller. Every step of a decorative concrete installation is important, but perhaps the single biggest factor that determines a successful outcome is the amount of antiquing release left on the sealed surface. Leaving too much release yields a project prone to premature sealer failure and cosmetic defects. Antiquing release is a waterproof powder with pigment added. It is called “release” because it keeps stamps or rollers from sticking to the concrete while texturing. In other words, it allows them to release cleanly. Antiquing release is meant to enhance the appearance of stamped concrete by adding a contrasting secondary or “highlight” color. This secondary color should be evident on about 10% of the overall slab, and should be visible mainly in the deepest joints and depressed areas of texture. These are areas where the release was actually embedded into the paste during the stamping process. The “high spots” of the stamped surface should exhibit only the base color. Therefore, the antiquing color should by no means become the predominant color. If the final color of the job resembles the release color more than it does the base color, then too little release was removed which can ultimately lead to sealer failure. But why is this so? Similar to dirt atop a concrete slab, powdered antiquing release is a bond-breaker which will not allow liquid sealer to properly bond with the concrete beneath. Removing as much powdered release as possible is imperative! Only the release actually embedded into the paste should remain. Even using high-powered pressure washers will not necessarily remove enough release. Often an aggressive scrubbing (after the concrete is cured enough to allow it) is required. Many contractors use a dilute acid/water solution, soap, or even electric buffers with brush attachments to accomplish this. As noted above, if the sealed slab resembles the antiquing color more than the base color, not enough release was removed. As almost any seasoned concrete stamper can attest, sealer problems are probably the single biggest reason for callbacks from disappointed homeowners. The acrylic sealers normally used on decorative concrete are film formers. They seal by forming a protective layer atop the concrete which makes it more difficult for water to penetrate. They also provide a glossy shine that enhances the color and appearance of the surface. They are very similar to clear paint. Now consider what happens if you paint over dirt, especially outdoors. The paint peels off! It’s the same with clear sealer over excess powdered release. When the misapplied paint peels off, what is attached to its back side? The painted-over dirt of course, and the wall that formerly held the paint is a bit cleaner as a result. When clear sealer peels off an improperly cleaned stamped concrete slab, it takes the excess antiquing release with it leaving a brighter spot. This makes the overall job look blotchy or possibly even devoid of a secondary color in those bare spots. The result is sure to be a call from a disgruntled homeowner who wants repair work done. Simply recoating the bare spots with clear sealer will not restore the slab to its original appearance because the amount of remaining highlight color is less than that of the surrounding, still-sealed spots. To bring the colors back to original, one must either apply a tinted sealer, or re-antique the bare spots prior to applying another clear coat. Depending on how this is done, the installer may unwittingly create another bond-breaker which will again cause the sealer to delaminate. These are all good arguments for using tinted liquid release instead of powder. It is certainly quicker and cleaner, and when the liquid evaporates there is powdered antiquing release left pooled in the low spots. Tinted liquid release is a viable product when used properly. However, what many contractors don’t understand is that they still need to clean off the excess release powder after the liquid has evaporated. Excess release is any powder that is not actually embedded into the stamped paste, but is simply lying on top of it. Many contractors simply seal over this excess release, causing the sealer problems discussed above. As an example, it’s like putting muddy water on a slab, letting the water evaporate, then sealing over the resulting dirt. The process of using tinted liquid release came about with the advent of using stamped concrete (or stampable overlays) for indoor flooring. Contractors needed a way to stamp indoor concrete without causing a dusty mess. They also needed to obtain a secondary color. Tinted liquid release was the answer. Mixing powdered release in liquid introduces much less residual bond-breaker onto the surface and requires far less cleaning afterward. It is one way to produce indoor stamped concrete. Unfortunately, many contractors saw this as an easier means to stamp exterior concrete. It was attractive to them because they felt it could save a great deal of time and effort spent cleaning the slab between stamping and sealing. However, the conditions that exterior concrete sealer must endure are much different than those of indoor sealer. The sealer itself is not permanent because it breaks down with UV rays, traffic, and weathering. When sealer flakes or wears away, it takes whatever substance is stuck to it along for the ride. In many cases, that substance is excess powdered release. Often contractors stamp with clear liquid release outdoors, and then antique it after the fact by applying tinted liquid release and allowing it to puddle in the stamped depressions. None of the powder is embedded into the paste, and all of it is simply lying on the surface. When the sealer fails, the antiquing color can go with it. To solve this problem, Butterfield Color has recently introduced a product called Perma-Tique. Perma-Tique is a cement based antiquing agent that is mixed with water and sprayed onto the stamped surface. Because it contains cement, it bonds tenaciously. Antiquing with Perma-Tique offers the appearance of antiquing with powder, but is much cleaner. It is easier and less expensive than antiquing with tinted liquid release and it sticks much better to the surface. It does not create a bond-breaker which will cause the sealer to delaminate. 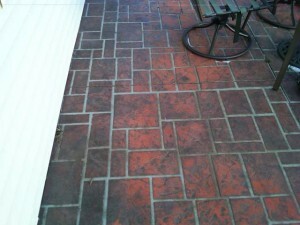 In short, Perma-Tique is a great product for antiquing or re antiquing stamped concrete, be it new or old. For more information about Perma-Tique, please read the article entitled “A Cleaner Way to Stamp”. Perma-Tique is available at The Concrete Store in Fishers, Indiana.